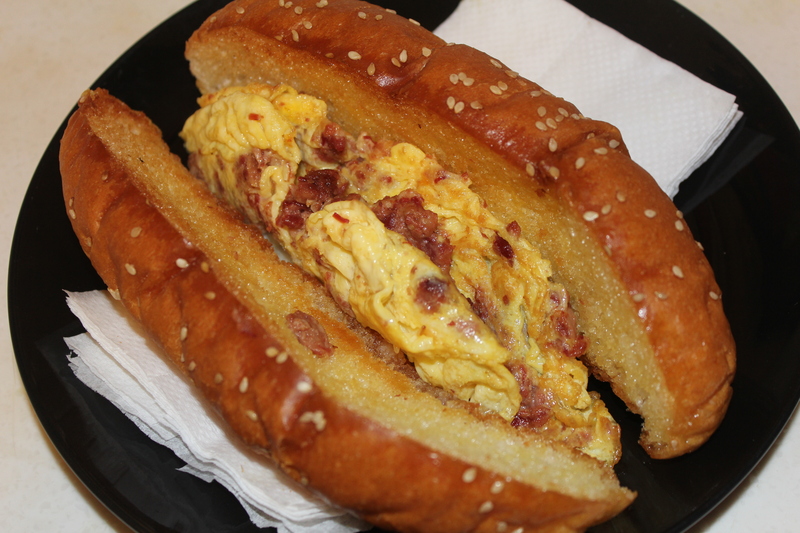 A certain picture of a certain breakfast item long held our interest in Hong Kong…but the mere thought of its weirdness put us off actually trying it for the longest of times. You’re probably thinking something offal based or super spicy right? What food could possibly have the team at waterfallsandcaribous somewhat reluctant to fill their bellies with something new and undiscovered?! The mind boggles. The culprit? 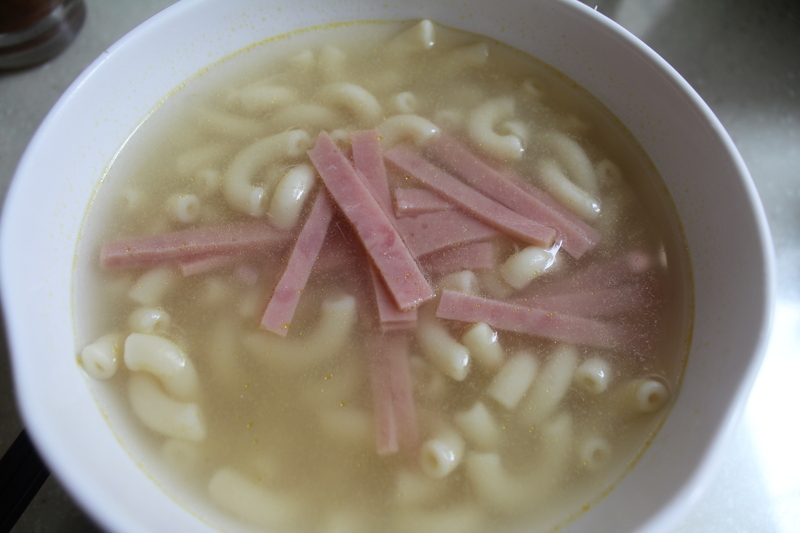 Macaroni soup. Exactly as it sounds, this dish is basically bog-standard packet elbow macaroni, sunk in a basic broth with varying kinds of meat floating on top. Ham is the standard of breakfast champions but you’ll also find pork chop, satay beef, spicy pork and various other combinations. But how ‘Hong Kong’ can that really be?! We hear what you’re thinking. Rest assured, its even on the local McDonald’s menu. THAT’S how ingrained in the culture here this little bowl of delight (?) is…but let’s take it back a step. Cha Chaan Teng means, quite literally, ‘tea restaurant’, and these little gems are found widely throughout not only Hong Kong but also Macau, Taiwan and parts of Southern China. A post-war creation, these restaurants were set up in order to provide cheap ‘Western’ food and kinda morphed into its own style of Canto-Western or ‘Soy Sauce Western’, meaning that a total hybrid of food choices exists, as well as a hybrid of what actually might be on one plate. Think fried fish cutlet with mayonnaise drenched fruit salad or a braised fish and eggplant dish. Whenever you sit down to dine at one of thse places, tea will be put down in front of you and many of the sets also have a drink included. Our favourite of these places just happens to be On Our Street (seriously, how many times have we been able to now say that?! Our lives are awwwwwesome! 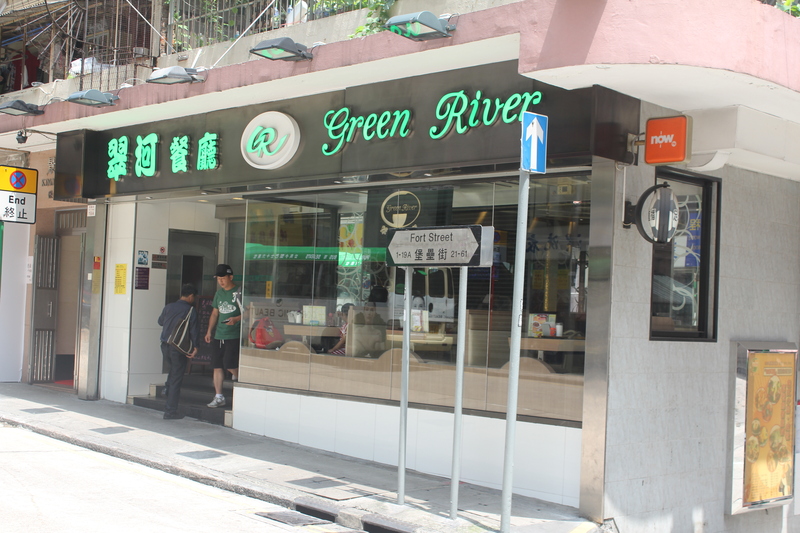 ), open 24 hours a day and named Green River. It’s a chain for sure but a great representation of the type of food that these establishments offer as well as our now being our Hong Kong cheap n’ cheerful – our go-to when there is a typhoon, black rain, no food in the cupboard, or our brains won’t let us think further than the corner. Sweet. Being 24 hours, the menu changes throughout the day offering breakfast, tea sets and roast meat dishes at particular times, while many dishes are available throughout the whole period. At night, they have a full Chinese style menu, which features hundreds of delicious stir-fry, braised and deep fried dishes, including all those bad boys you might have enjoyed from your local Chinese takeaway back home – fried rice, sweet and sour pork, deep fried squid. We’re not going to go too much into this particular area of cuisine as it’s probably the most familiar to people but let us just confirm now once and for all that YES sweet and sour pork is consumed in this part of the world, YES locals order it too, and that YES it is delicious. And NO, it’s actually not all that different from what you might have eaten in your country. Let’s be honest – deep fried chunks of meat swimming in a sticky, pink sauce. It’s good. 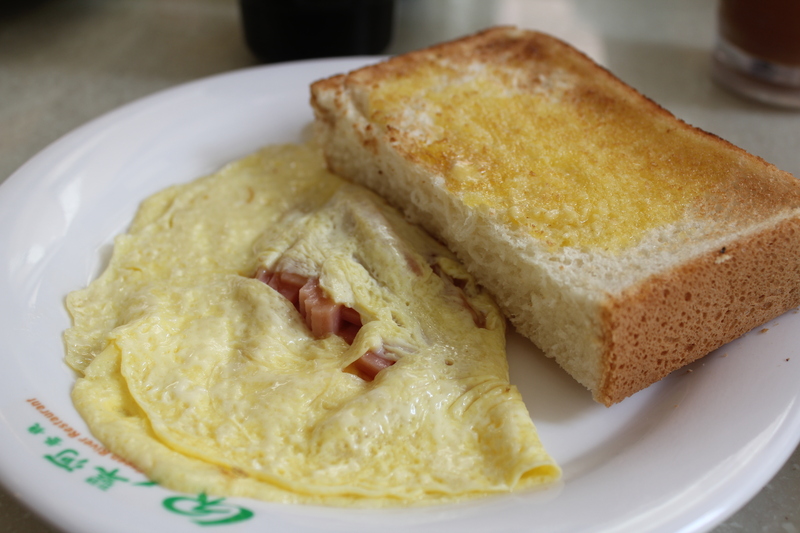 Breakfast is a regular option here for us at our local Cha Chaan Teng. 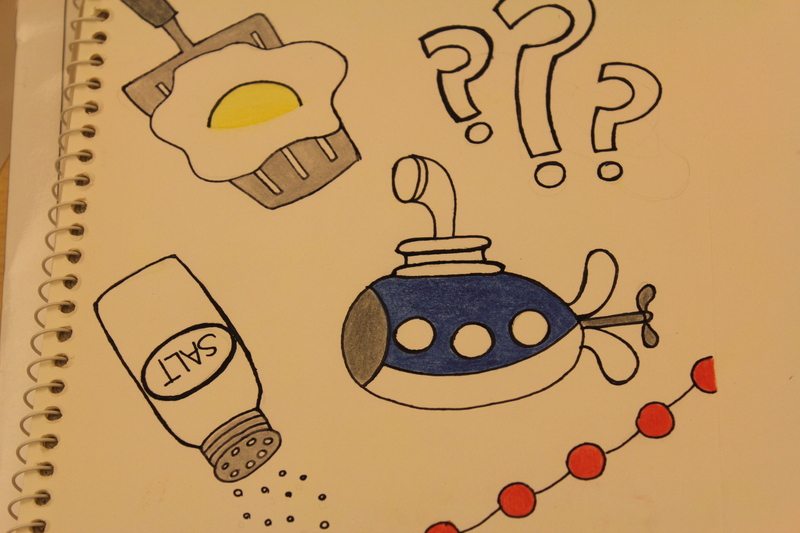 You won’t get eggs like you’d make at home but somehow that doesn’t matter as they come as part of a fun set, which can include toast, macaroni soup, and of course, a drink. Our favourite set is has the inspiring title of ‘Regular Set Meal’, is priced at a mere $39 HKD! Of course, it totally features a bowl of macaroni soup, which after having finally been brave enough to try has become one of our favourite guilty pleasures. We think we’re turning Hongkinese, we think we’re turning Hongkinese, we really think so…! Tea time is an absolute institution in Hong Kong but these places don’t offer small cakes on fancy towers or such, so get that out of your head right now. What they do offer for a few hours a day (usually 2.30pm – 6pm in any self respecting Hong resto!) is an extremely cheap set of a snack sized portion of food, sometimes sized down from the all-day menu or sometimes a tea-time only special, together with a drink. 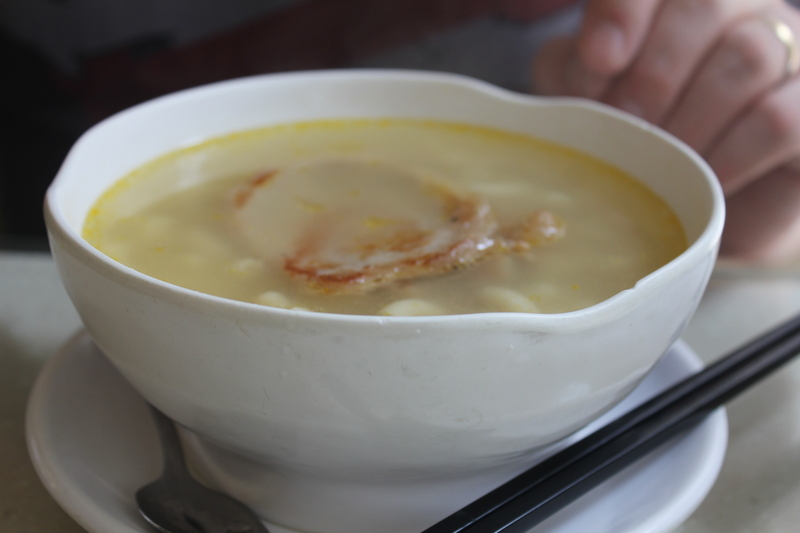 If you’re on a budget, this is one of the best times of day to eat in Hong Kong AND you’ll get a true local experience. With mention of ‘tea time’ it’s probably a great time to introduce you to some of the unique drinks that you’ll (hopefully) only find at such establishments. 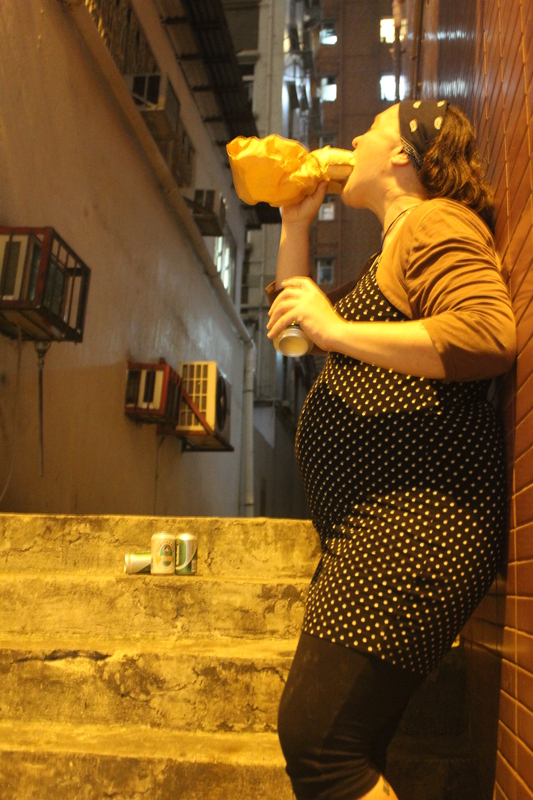 The most Hong Kong of the lot is simply known as ‘milk tea’ and is basically tea that has brewed all day and has inordinate amounts of milk and sugar poured in to temper the Extreme Tannin. It’s quite, quite awesome. 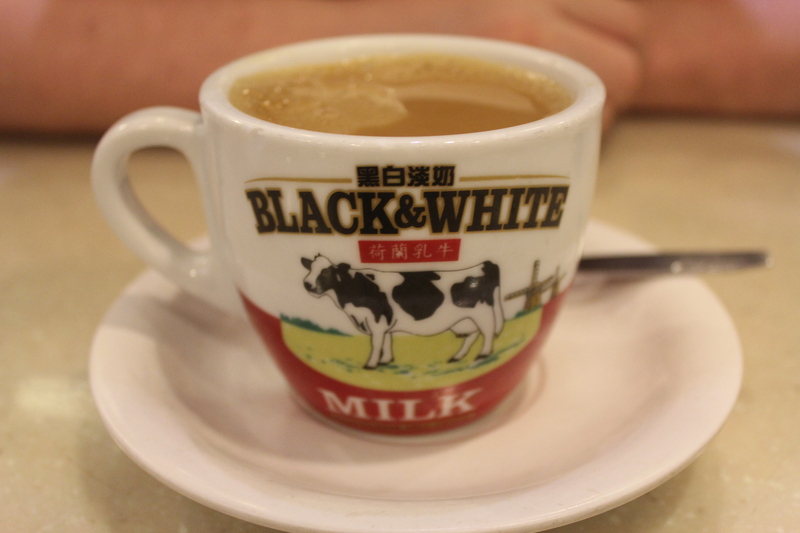 Also awesome are these Black & White milk company cups which you’ll see all over Hong Kong and which we plan to buy a set of and take back to NZ with us. So iconic. And slightly ironic due to the actual lack of cows here. There’s also coffee, served hot or iced (the hot is disgraceful), lemon teas, or the odd Yuen Yang – a half/half blend of tea AND coffee, just in case you really can’t decide! At this point we really want to showcase a few really special items that you’ll find lurking at all good tea houses around and about. Peanut butter and condensed milk toast – yes, it is exactly what it sounds like. Coronary inducing and bizarrely addictive. 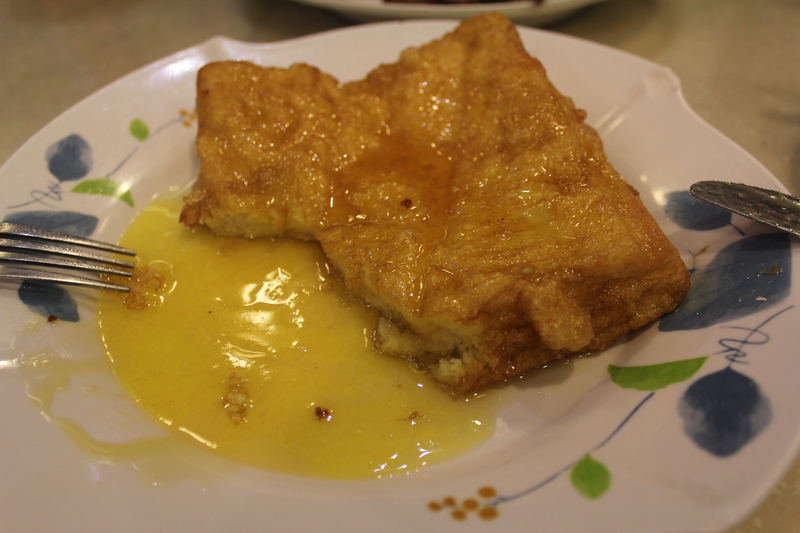 Hong Kong style french toast – also coronary inducing, perhaps due to the block of butter that it comes sitting on top of the already fried toast…that you then pour syrup over. 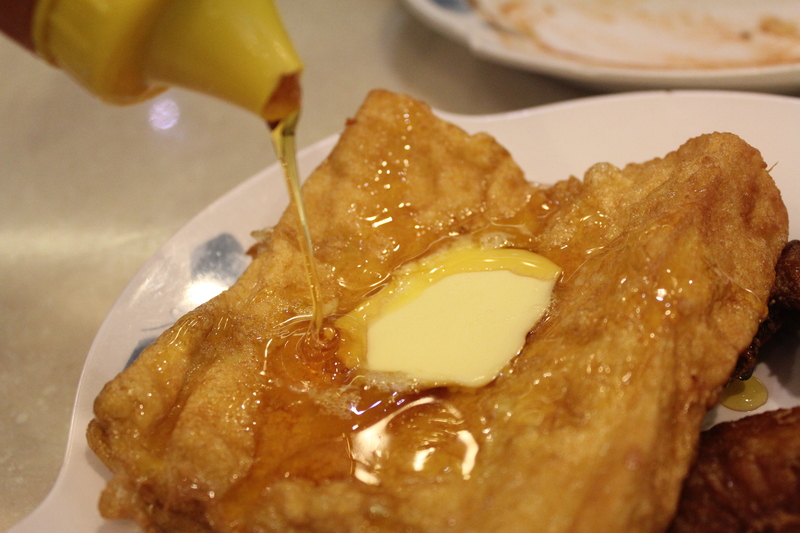 Mmm…buttery syrup…. 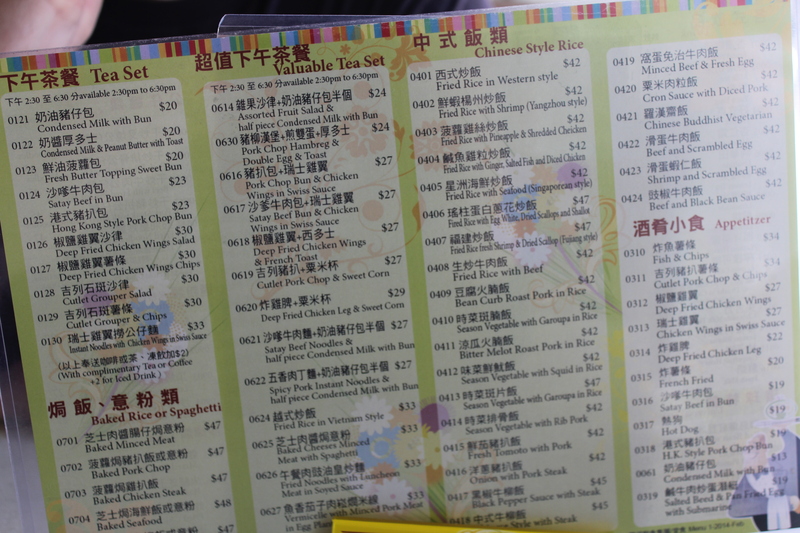 At tea time, it’s especially economic at $27 with a side of deep fried chicken wings. Is your stomach groaning at the mere thought?! 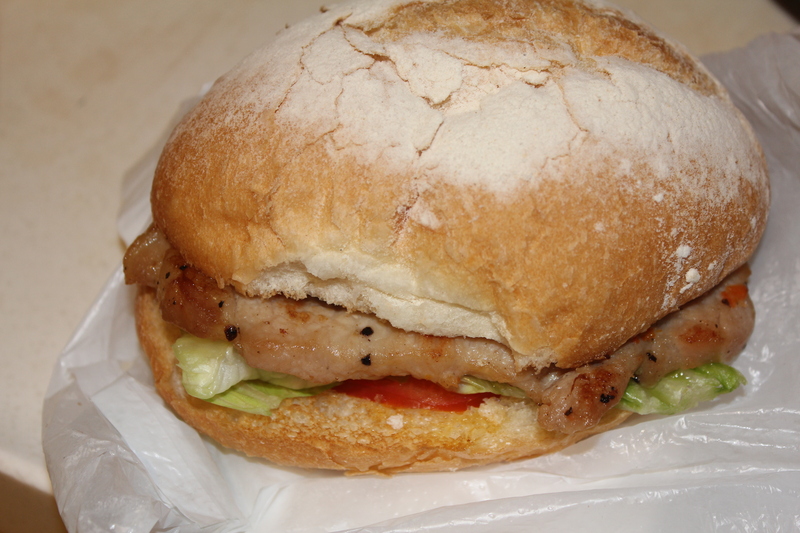 HK pork chop bun – a pork chop, served funnily enough in a bun, usually with slightly too much mayo, a little bit of lettuce and a slice of tomato. Yum. Available 24 hours a day, these are now the drunken equivalent to us of a late-night kebab. 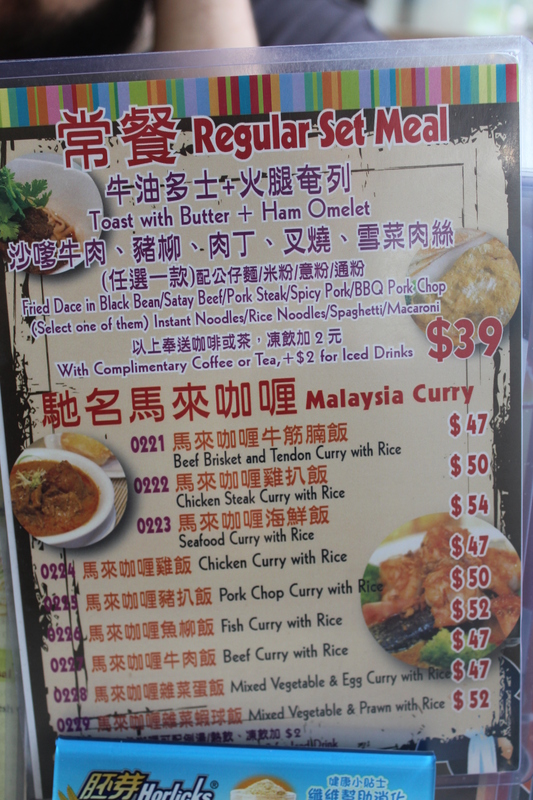 Curry and rice – the stock standard, weirdly-yellow generic MSG laden curry you’ll find all over Asia. Sometimes it just hits the spot. Club sandwich – for when you just can’t be bothered. Not too dissimilar from the room-service menu entry of every over-priced hotel in the world and so much cheaper. Spam sandwich – well, it wouldn’t be a true Asian hybrid resto without some kind of Spam inclusion, right?! 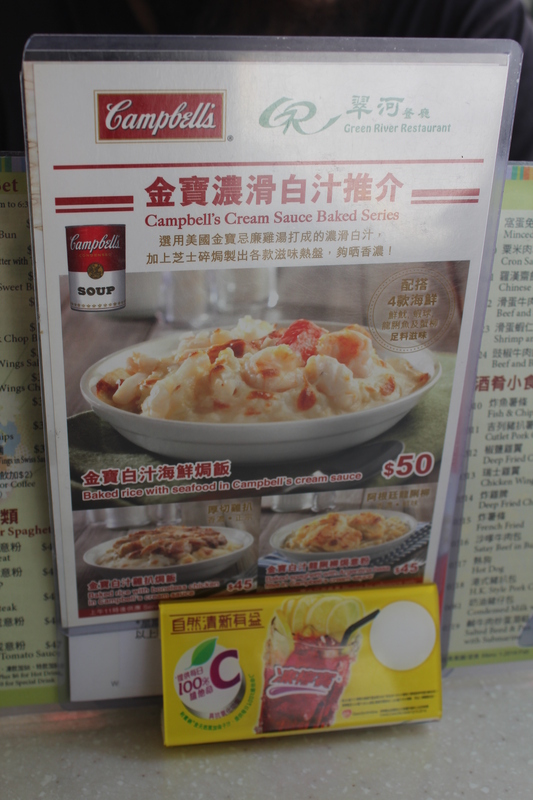 Campbell’s Soup dishes…actually, we refuse to order these because they look truly awful, so we’ll have to satisfy you with a mere picture of the menu. By ‘sauce’ they mean literally a tin of Campbell’s soup poured over the top of some concoction, then baked. If you want to know more, order one yourself. 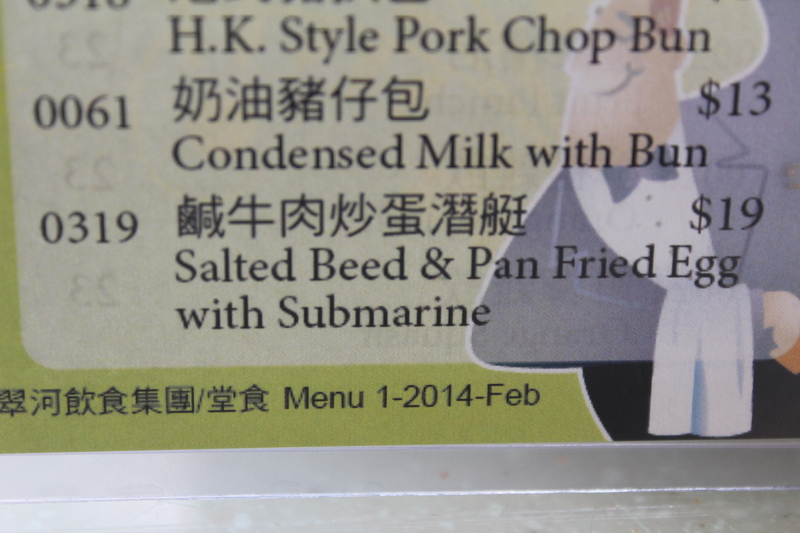 And our favourite entry on the menu?! The mysterious entry at number 319 “What on earth…?” we pondered about a thousand visits before we were actually brave enough to order it. Would it be the stuff of our fantasies? The reality was not half as entertaining. 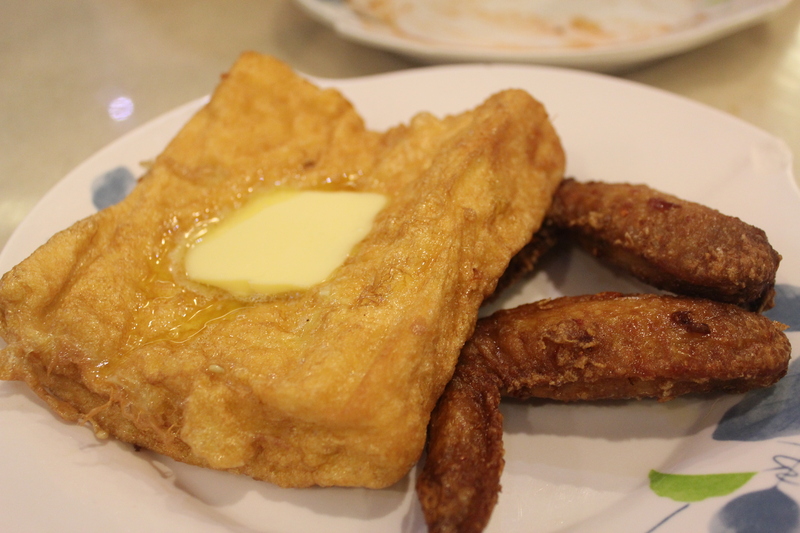 I think this post may be one of the most detailed posts on a Cha Chaan Teng that I’ve ever seen. Keep on eating! I love that when you finally tried the soup, you ended up hooked on it! =) But I’m very concerned about the Campbell’s menu. Eek! No way, no how! Wow, I never even knew about these places when I lived in HK as a child. My parents were boring and stayed away from ‘local food’ unless it was yumcha. Can’t wait to try some of these cha places when I’m there.. any recommendations for good ones in Wanchai/Causeway Bay area? Hmm…we shall put some thought into that. There are definitely some spots we love in those areas in all styles of cuisine. 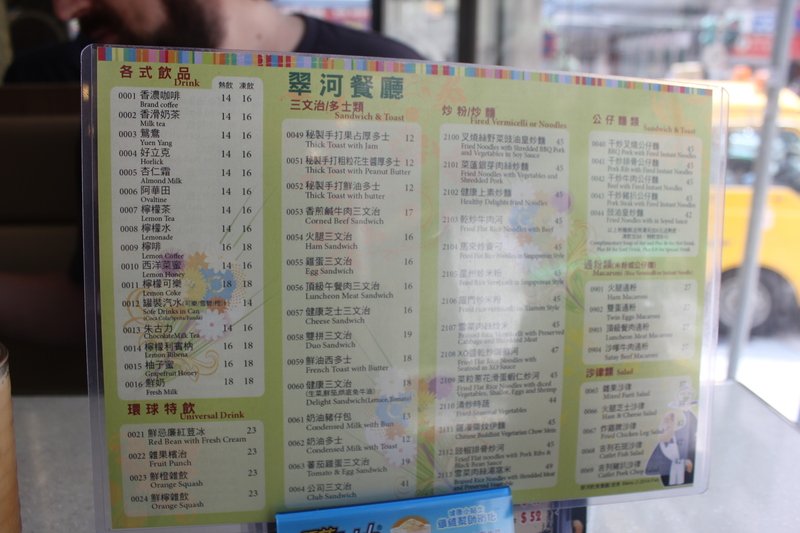 It may be rather a lengthy list that ins’t limited to just cha chaan teng, hehe. You’re always welcome to join us for brekky at ‘The River’ too! While I love trying different kinds of food, I have just not been able to get myself to do that macaroni soup with meat floating on top. Really? I mean, really?!? Wow I am so behind on the blog!!!! SPAM!!! Hong Kong cafes = SPAM! More SPAM!!!! Lol, a SPAM fan?! It’s not the first time we’ve blogged about it either, haha. Asia = SPAM-tastic!